Cheyne Dougan, assistant principal at Clarksville High School, Ark., in this July 11 photo. CLARKSVILLE, Ark. - As Cheyne Dougan rounded the corner at Clarksville High School, he saw three students on the floor moaning and crying. In a split-second, two more ran out of a nearby classroom. "He's got a gun," one of them shouted as Dougan approached with his pistol drawn. Inside, he found one student holding another at gunpoint. Dougan aimed and fired three rounds at the gunman. Preparing for such scenarios has become common for police after a school shooting in Connecticut last December left 20 children and six teachers dead. But Dougan is no policeman. He's the assistant principal of this school in Arkansas, and when classes resume in August, he will walk the halls with a 9 mm handgun. Dougan is among more than 20 teachers, administrators and other school employees in this town who will carry concealed weapons throughout the school day, making use of a little-known Arkansas law that allows licensed, armed security guards on campus. After undergoing 53 hours of training, Dougan and other teachers at the school will be considered guards. "The plan we've been given in the past is 'Well, lock your doors, turn off your lights and hope for the best,'" Superintendent David Hopkins said. But as deadly incidents continued to happen in schools, he explained, the district decided, "That's not a plan." After the Connecticut attack, the idea of arming schoolhouses against gunmen was hotly debated across the country. The National Rifle Association declared it the best response to serious threats. But even in the most conservative states, most proposals faltered in the face of resistance from educators or warnings from insurance companies that schools would face higher premiums. In strongly conservative Arkansas, where gun ownership is common and gun laws are permissive, no school district had ever used the law to arm teachers on the job, according to the state Department of Education. The closest was the Lake Hamilton School District in Garland County, which for years has kept several guns locked up in case of emergency. Only a handful of trained administrators - not teachers - have access to the weapons. Clarksville, a community of 9,200 people about 100 miles northwest of Little Rock, is going further. Home to an annual peach festival, the town isn't known for having dangerous schools. But Hopkins said he faced a flood of calls from parents worried about safety after the attack last year at Sandy Hook Elementary in Newtown, Conn.
Hopkins said he and other school leaders didn't see why the district couldn't rely on its own staff and teachers to protect students rather than hire someone. In this photo taken July 11, a Clarksville schools faculty member, wearing a protective mask, rear center, carries a practice handgun toward a classroom in the city's high school in Clarksville, Ark. "We're not tying our money up in a guard 24/7 that we won't have to have unless something happens. We've got these people who are already hired and using them in other areas," Hopkins said. "Hopefully we'll never have to use them as a security guard." State officials are not blocking Clarksville's plan, but Arkansas Education Commissioner Tom Kimbrell is opposed to the idea of arming teachers and staff. He prefers to hire law enforcement officers as school resource officers. There are other dissenters, too. Donna Morey, former president of the Arkansas Education Association, called the idea of arming teachers "awful." The risk of a student accidentally getting shot or obtaining a gun outweighs any benefits, she said. "We just think educators should be in the business of educating students, not carrying a weapon," Morey said. Participants in the program are given a one-time $1,100 stipend to purchase a handgun and holster. Hopkins said the district is paying about $50,000 for ammunition and for training by Nighthawk Custom Training Academy, a private training facility in northwest Arkansas. The Nighthawk training includes drills like the one Dougan participated in, with various role-playing scenarios involving shooters on campus. Dougan and other teachers in the program practiced using "airsoft" pellet guns, with students wearing protective facemasks and jackets. "There's pressure on you, because you're shooting real bullets if this actually happened," said Dougan, who has three children attending Clarksville schools. "I was nervous to start, but once it started and I was going through what they had taught us, it just took over." 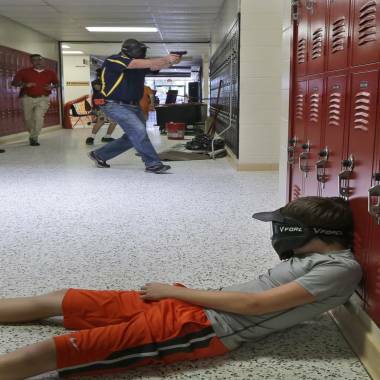 The training is narrowly tailored for teachers to respond to shooters on campus. Sydney Whitkanack, who will enter seventh grade this fall, said she's grown up around firearms and doesn't mind if teachers or staff are armed at school. "If they're concealed, then it's no big deal," said Whitkanack, who was an actor in the training scenario. "It's not like someone's going to know 'Oh, they have a firearm.'" The district will post signs at each school about the armed guards, but the identities of faculty and staff carrying weapons will be kept secret, Hopkins said. Sherry Wommack said the program is one reason she's taking her son, an incoming eighth-grader, out of Clarksville's schools before the school year begins. Wommack said she doesn't believe teachers should make life-or-death choices involving students. 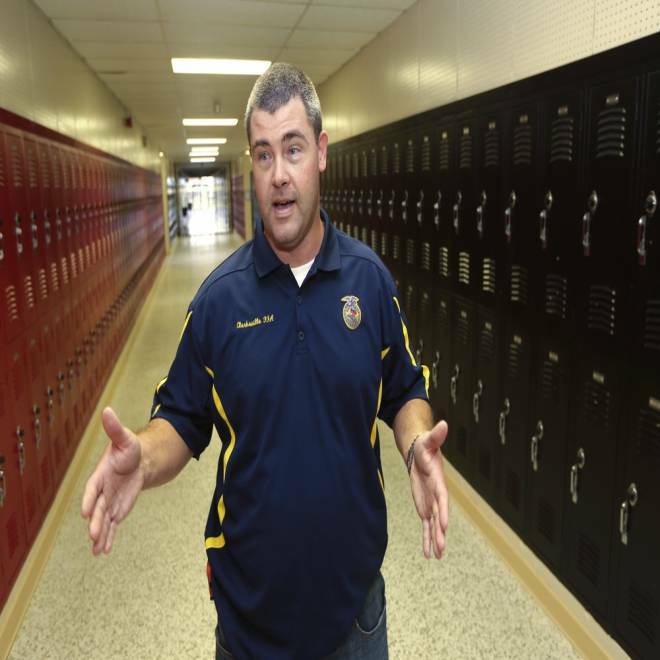 "I think police officers are trained to make those decisions, not teachers," Wommack said.